Marie letemplier perfected this recipe. Our son loves these bars. These can also be packed for school lunches/snacks or can be post workout treat for the teenagers. Not only that, adults love these bars as much. However, for adults it is better to consume in limited quantities since you cannot stop with one. These bars can also be stored in an airtight container in the fridge for 2 weeks but they rarely last for so long in our house. In a large glass mixing bowl combine peanut butter, chocolate chips, maple syrup and apple sauce and microwave it for 2 to 3 minutes until the chocolate chips melt. Remove from the microwave and stir until the chocolate chips and other contents are combined well. Add the coconut, oatmeal, and pecans to the above mixture. Stir to combine. Line an 8 inch pan with parchment paper. Scoop the mixture into the pan and flatten it with a spatula. Refrigerate for 3to 4 hrs until the mixture is firm. 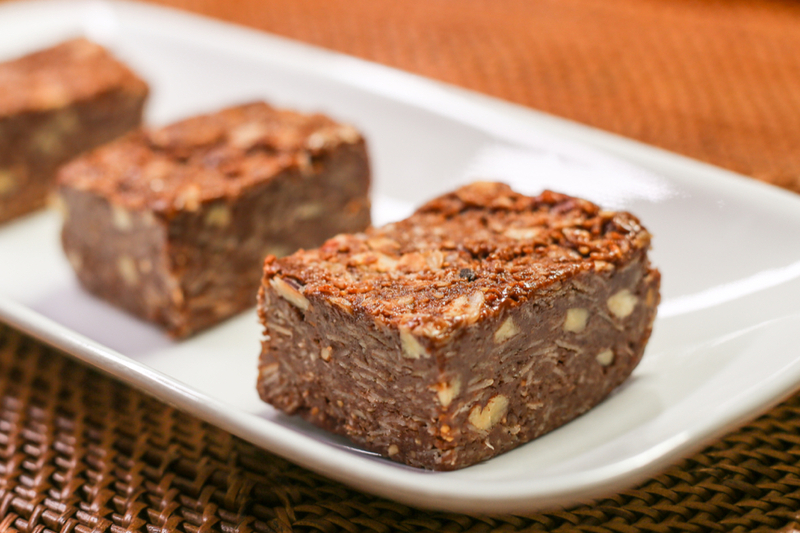 Once done, you can use a sharp knife to slice the mixture into bars or small squares. You can use teh side of parchment to lift it from the pan.